We go into the garage backstage to see a parked limousine. The driver gets out and opens the door. Out comes Mr. McMahon. McMahon begins to walk, but then he stops and motions for the driver to come over and buff out a smudge on the limo. Satisfied with the results, McMahon continues to walk. 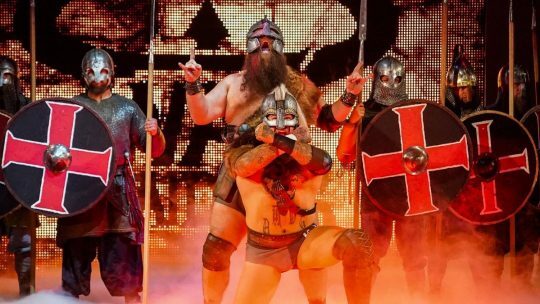 We go live into the arena to see Braun Strowman make his way to the ring. Strowman gets a good reception while he gets in the ring. Strowman says Brock Lesnar has always been afraid of him, even if he won’t admit it. When he had the Money in the Bank contract, Lesnar was constantly looking over his shoulder. When he had a Universal Championship match in the Hell in a Cell, Lesnar ripped the door off to prevent him from winning the title. Then at Crown Jewel, he enlisted Baron Corbin to help him win it. Strowman says he is all healed up. Corbin is out of power, so there is no one to save Lesnar. 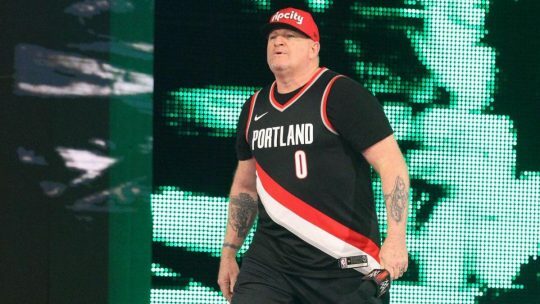 Lesnar’s biggest fear is about to come true. At Chase Field in Arizona, he will get the Universal Championship. The only thing Lesnar will get is these hands! Baron Corbin comes out to the stage to boos from the crowd. Corbin says he may not be running RAW… Strowman says because he got fired. Strowman starts up a “You got fired” chant, but it doesn’t last. Corbin says the crowd will have to listen to every word he has to say. If Corbin stays for five minutes it’ll be longer than Strowman lasted against Lesnar. Corbin tells Strowman to stop lying and letting the people down. Strowman can’t beat Lesnar. While Strowman realizes that, Corbin will focus on winning the Royal Rumble and go where Strowman will never go: the main event of WrestleMania. Strowman gets out of the ring and wildly chases him backstage. We go backstage to see Strowman stalking around looking for Corbin. The Singh Brothers aren’t sure where Corbin went, so Strowman throws Sunil Singh across a table. Strowman continues to look and walks off. Elias strums a chord and starts to narrate what is going on. Elias sings that Corbin ran his mouth and got in trouble. Elias sings that he knows where Corbin is. Strowman appears next to him, so Elias sings that Corbin is down in a limo. Strowman stalks toward a limousine and kicks the side mirror off it. Strowman pulls the driver out of the window and throws him across the hood of the car. Strowman grabs a pipe and smashes the window open. Corbin is screaming in fear while Strowman rips the door off the car. Corbin gets out on the other side and runs off. Mr. McMahon then comes up to him and is upset. McMahon sneers and looks at the mess that was his limo. McMahon doesn’t say anything. After commercials, we go backstage to see Strowman trying to put the door back on the limo, but it falls off. McMahon says Strowman is a wrecking ball. This will cost him $100,000. Strowman is furious and says this piece of crap is not worth it. McMahon says if he’s going to raise his voice, his Universal Championship match is canceled. Strowman is furious while McMahon walks off. Strowman then grabs the bottom of the limo and tips it over in fury. After more commercials, we go backstage to see Braun Strowman being escorted out of the arena. Baron Corbin walks off smiling. The bell rings, and Sasha Banks starts out against Nia Jax. Jax says she wants Ronda Rousey, so Rousey gamely goes for a tag. Banks then blindsides Jax and hits a hurricanrana. Banks hits a pair of running double knees. Jax blocks a second one and puts her on the top rope. Banks kicks her back, but Jax soon takes her down. Banks goes for an arm drag, but Jax doesn’t budge. Jax lifts her, but Banks jumps on her back for a sleeper hold. Jax knocks her off. Banks comes back with another sleeper hold, but Jax slams her off. Banks gets on the top rope, boots her back, and hits a bulldog. Banks connects with a sliding knee for a two count. Ronda Rousey tags in, and the crowd cheers. Rousey punches her to the corner, but Jax soon stops her. Tamina tags in and head-butts Rousey down. Rousey immediately comes back and takes her down for an arm bar, but Jax pulls Tamina out of the ring to avoid it. Jax and Tamina game plan at ringside. They stay outside for quite some time while Rousey waits in the ring. Banks then takes Jax down to get some action going. We come back from the break to see Jax applying a bear hug to Banks. Banks fights out, but Jax powerbombs her for a two count. Jax hits a bowling ball splash on her for another two count. During the commercial, Tamina blind tagged in and superkicked Banks. Back to live action, Jax applies a chin lock. They then go to a picture-in-picture frame to play the trailer for the movie Glass. Banks gets out of the chin lock with a jawbreaker, but Jax quickly floors her with a back elbow. Tamina goes for a scoop slam, but Banks counters with a roll-up for a two count. Banks goes for a tag, but Tamina stops her. Tamina then knocks Rousey off the apron. Banks sidesteps Tamina, sending her into Jax. Banks then hits a Russian Leg Sweep and applies the Bank Statement for the submission. Charly Caruso gets in the ring and says their upcoming match didn’t stop them from winning. Rousey says they respect each other and says it was an honor to tag her. Beating Sasha Banks at the Royal Rumble will be her greatest victory as RAW Women’s Champion. Banks takes exception with that. Rousey says she’ll do everything in her power to tap Banks out at the Royal Rumble. Banks says Rousey isn’t the only one that can tap people out. Maybe she can ask Nia Jax and Tamina how that felt. Banks will face anyone anytime and anywhere. Banks says it’ll be her pleasure to teach Rousey how to lose with class. Rousey says she can keep the title of “The World’s Classiest Loser” because she doesn’t want it. Banks says she’s not a loser. Last week, Rousey said Banks was the best. It wasn’t the other way around. The only loser will be Rousey at the Royal Rumble. She’ll tap Rousey out and take back her title. Bank on that. Banks then walks off. Rousey then runs after her and says she didn’t mean how that came out. Banks walks off on her. Backstage, some superstars are waiting outside Mr. McMahon’s door. Jerry Lawler then comes out to a big reception. No Way Jose and his entourage then dance past Lawler. 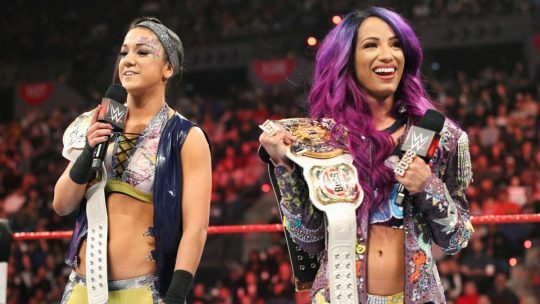 We go backstage to see Bayley and Natalya holding back Sasha Banks and Ronda Rousey. They both convince Banks and Rousey to walk off. Natalya says Banks has to learn how to control her emotions, which Bayley takes exception to. They start to argue until The Riott Squad walks up. The Riott Squad says everyone else is falling apart while they stay together. They make fun of Natalya and Bayley before walking off. Scott Dawson is furious that the Lucha House Party didn’t say anything about Dawson’s foot being on the bottom rope last week. It’s time to pay up. It’ll be Kalisto and Gran Metalik representing their unit. Dash Wilder takes Kalisto down and mocks them. Kalisto makes a comeback and takes Wilder down with a nice springboard arm drag. Kalisto and Metalik hit Wilder with a double-team splash for a two count. Dorado tags back in, but Dawson comes in and takes him down. There was a backstage segment outside of Vince McMahon’s door in the middle of the match (see below). We go back to this match, which is still just existing. 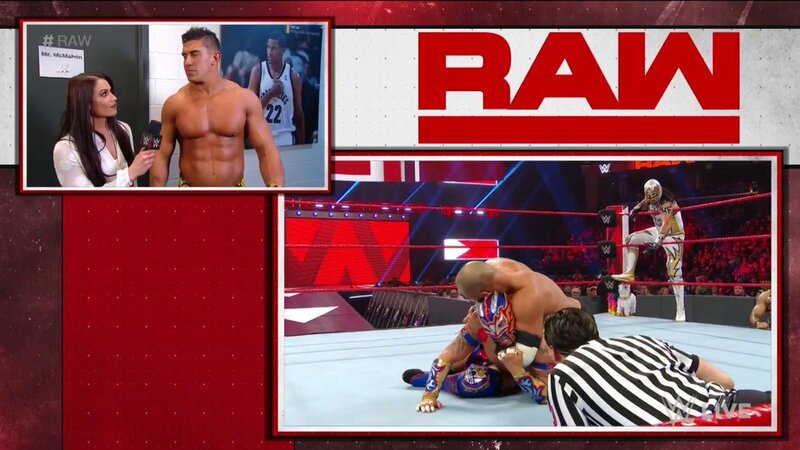 Metalik takes both of them down before The Revival makes a comeback. Kalisto runs in to help, but he’s eventually taken out. Dawson DDTs Metalik and covers. Metalik gets his foot on the bottom rope, but Wilder pushes it off. The referee doesn’t see this. We go backstage in the middle of the above match to see Dasha Fuentes outside Mr. McMahon’s door. She interviews Apollo Crews, who wants a title shot at the Royal Rumble. Curt Hawkins wants a shot and make it Lesnar vs. The Streak. Fuentes turns and sees EC3 standing there. The B-Team then comes up, as well as Heath Slater. Mr. McMahon makes his way to the ring. McMahon goes to speak, but John Cena’s music hits. Cena makes his way down to the ring to a good reception. Cena says McMahon just lost a Universal Championship on the biggest event on the Road to WrestleMania. McMahon is out here to tell someone to step up. Cena will save him the time and trouble. Stone Cold Steve Austin, The Rock, and Brock Lesnar (who went to go play football) all walked off. McMahon turned to his crew of rejects and told someone to step up. Cena looked him in the eye and said he wouldn’t let him down. McMahon gave him a chance, and Cena didn’t let him down. Then McMahon gave him more chances. Cena missed birthdays, weddings, and funerals for this. Cena isn’t saying this for McMahon’s sympathy. Stepping up is missing your life and loving every second of it. Cena tells McMahon to give him a chance. He won’t let McMahon down. The Royal Rumble will be unforgettable. Cena will beat Lesnar and become a 17-time WWE Champion. How does he know? Cena has something no other WWE superstar has: ruthless aggression. A furious Drew McIntyre comes out to the ring. McIntyre doesn’t care about anything Cena has going on in his life. How dare Cena stand in the ring with a straight face and claim he still has ruthless aggression. McIntyre gets in McMahon’s face and says this is what ruthless aggression looks like. McIntyre says Cena’s time is up and his time is now. Just like Stone Cold, The Rock, and Lesnar, Cena can leave. Baron Corbin now makes his way out to the stage. Corbin says his life was threatened earlier tonight. Corbin isn’t the type of guy to have a lawyer on speed dial, but if he was… it’s best for business for him to get the Universal Championship match against Lesnar. Finn Balor now makes his way out to the ring. Balor says he’s a little tired of always being left out of these conversations. The three men in the ring can lay claims to a lot of things, but he’s the only person out here who has ever been Universal Champion. McMahon says maybe one day Balor will be, but there’s a lot of beef out here. McMahon says Balor has a lot of skill, but against Lesnar and all this beef… he doesn’t know. Balor says it’s time to be honest. McMahon never believed in him, but the people do. Balor says he knows McMahon is stubborn and won’t change his mind, so how about he shows him? Balor attacks Corbin, while McIntyre attacks Cena. McIntyre then takes Balor out with a Claymore Kick. McIntyre stalks Cena and hits him with a Claymore Kick. McIntyre stares at McMahon, who is standing on the apron smirking. McMahon says all four men want the match, so let’s have a Fatal 4-Way match to determine Lesnar’s opponent. 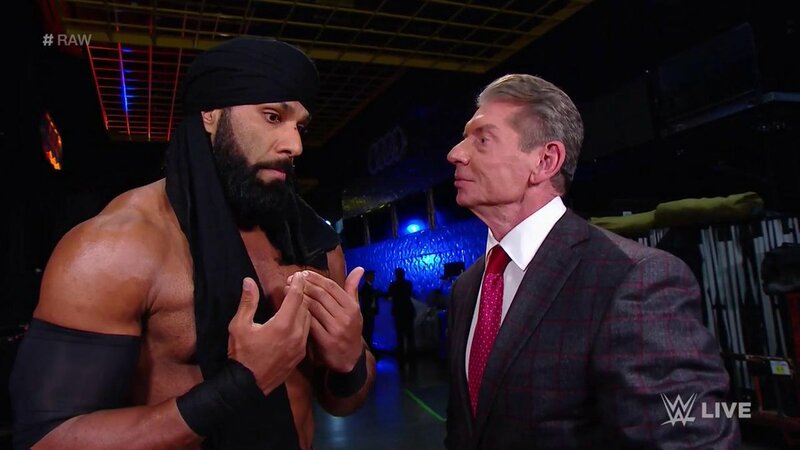 Mr. McMahon is walking with a stagehand backstage when Jinder Mahal stops him. Mahal says it’s an honor to be in McMahon’s presence and compliments his suit. Mahal accidentally calls him Vince and says he’s upset he wasn’t considered for the Fatal 4-Way Match. The WWE Universe was robbed of a dream match against Brock Lesnar last year. McMahon asks if Mahal really thinks people want to see Mahal versus Lesnar. 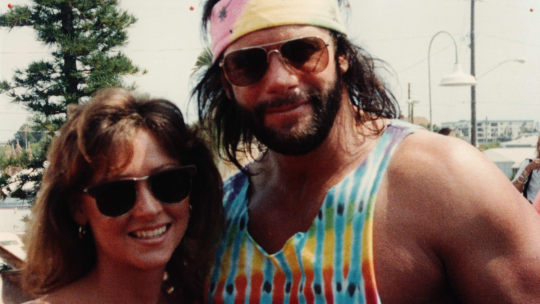 Mahal says he won’t let McMahon down. McMahon tells him to pick a man in the Fatal 4-Way. If he can beat him, he can get in the match. Mahal chooses to face Finn Balor. McMahon sarcastically wishes him luck. The commentators announce that the new arrivals from NXT will appear on both shows before they get assigned to a brand. 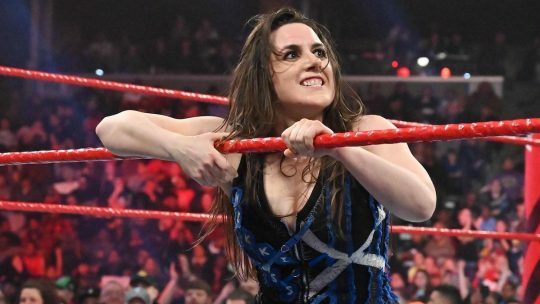 Nikki Cross is not officially on the RAW roster. Bayley will start against Sarah Logan, but Nikki Cross is wildly running on the apron. Bayley tags her in. Cross jumps on Logan’s back with a sleeper before being pulled off. Liv Morgan is tagged in, so Cross takes her down. Ruby Riott then comes in and stand with The Riott Squad. Natalya and Bayley join her, but Nikki yells to let her play. Nikki attacks Riott and takes on The Riott Squad. Natalya and Bayley then hit baseball slides on Morgan and Logan. Cross pulls Riott into the apron and forearms away at her. We come back from the break to see Logan standing over Bayley. Bayley fights up and does a slow motion double springboard move. Logan soon makes a comeback and hits a cartwheel kick. Logan gets Bayley back in the ring and tags in Morgan. Morgan comes off the second rope with a bulldog for a two count. Morgan jumps on Bayley’s back, and Riott gets a cheap shot in. Morgan picks up a two count. Logan tags in and applies a chin lock. Bayley fights up, but Logan stops her. Eventually Natalya tags in and hits a dropkick followed by a German Suplex. Natalya clotheslines Logan, and they nearly botch a wheelbarrow face-buster. Riott breaks up the pin and drags Logan to the corner. Bayley takes Riott out. Morgan gets in and hits a hurricanrana, but Cross breaks up the pin. Cross scares Morgan, and Natalya goes for a Sharpshooter. Morgan kicks her off, so Cross tags in. Cross and Natalya hit a Hart Attack on Morgan. Cross bounces Morgan’s head off the mat before hitting Logan with a neckbreaker. Natalya hits Riott with a German Suplex. Cross splashes Riott and Logan in the corner. Cross follows up with a bulldog on Riott and a bulldog on Logan. Natalya then whiffs a dropkick on Logan. Cross then jumps off the apron with a cross-body on Riott. Morgan quickly kicks Cross, but she quickly comes back. Bayley tags in, and Cross hits a rope hung neckbreaker. Bayley hits a diving elbow drop for the win. Finn Balor is walking backstage when he passes Mickie James and Dana Brooke talking to Lacey Evans. 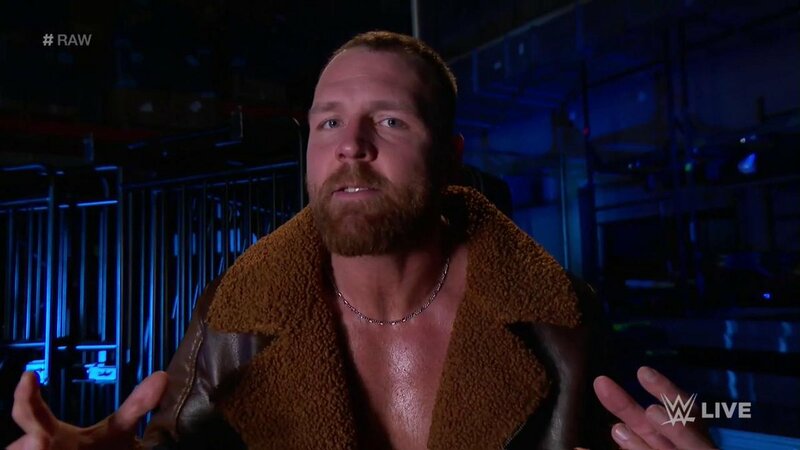 Dean Ambrose is backstage, and he’s furious he has to defend his Intercontinental Championship against Seth Rollins and Bobby Lashley while in Memphis. No one will take his championship. If Jinder Mahal wins, he’ll be entered into tonight’s Fatal 4-Way match to determine who will face Brock Lesnar at the Royal Rumble, removing Balor from the match. While Finn Balor is making his entrance, Samir Singh distracts him. Mahal then knocks him off the turnbuckle. Mahal attacks Balor at ringside and drives him ribs-first into the barricade. Mahal screams that he will be going to the Royal Rumble. Mahal gets him in the ring, and the referee checks on Balor. Mahal demands he ring the bell. Balor says that he can go. 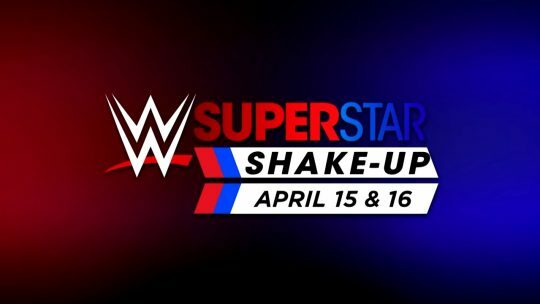 The bell rings, and Mahal superkicks Balor for a near fall. Mahal punches him down a few times before applying a chin lock. Balor fights up and dropkicks Mahal down. Mahal pulls him to the apron, but Balor knocks him off. Balor then goes for a running kick, but Mahal sweeps the feet. We come back from the break to see Mahal choke Balor before whipping him hard to the corner. Mahal elbows him down and applies another chin lock. Balor rolls over and picks up a two count. Mahal immediately goes back to the chin lock. Balor gets out with a jawbreaker and hits an overhead kick. Mahal hits a pair of running forearms before taking him down and hitting a double stomp to the midsection. Mahal gets out of a Sling Blade, so Balor dropkicks Singh off the apron. Balor sends Mahal out of the ring and connects with a somersault senton. Balor gets Mahal in the ring and hits a Sling Blade. Balor dropkicks him into the corner and hits the Coup de Grace for the win. Finn Balor remains in the Fatal 4-Way match against John Cena, Baron Corbin, and Drew McIntyre later tonight. The winner will face Brock Lesnar for the WWE Universal Championship at the Royal Rumble. Balor is clutching at his ribs, which seem to be injured. Lio Rush cuts a promo saying it’s time for people like Dean Ambrose and Seth Rollins to suffer. The people need Bobby Lashley as champion because he is a fighter. Lashley will become the Intercontinental Champion whether they like it or not. Ambrose and Rollins better come correct or not at all. Lashley will dominate and collect the Intercontinental Championship. Charly Caruso interviews Seth Rollins and talks about how he’ll have no problem kicking Dean Ambrose’s teeth down his throat. Last October, Ambrose betrayed six years of friendship with him and Roman Reigns. As for Bobby Lashley, physique will only get you so far. What matters is what you do bell to bell. No one on this planet can do what Rollins can bell to bell. Rollins will lay it all on the line and take back his Intercontinental Championship. Ambrose tries to convince Rollins to team with him to take out Lashley. Rollins throws Ambrose into Lashley. Rollins takes Lashley out and hits a plancha. Ambrose attacks, but Rollins cuts him off. Rollins gets him in the ring and hits a cross-body block off the top rope for a two count. Lashley runs in, but Rollins stops him. Ambrose attacks Rollins from behind. 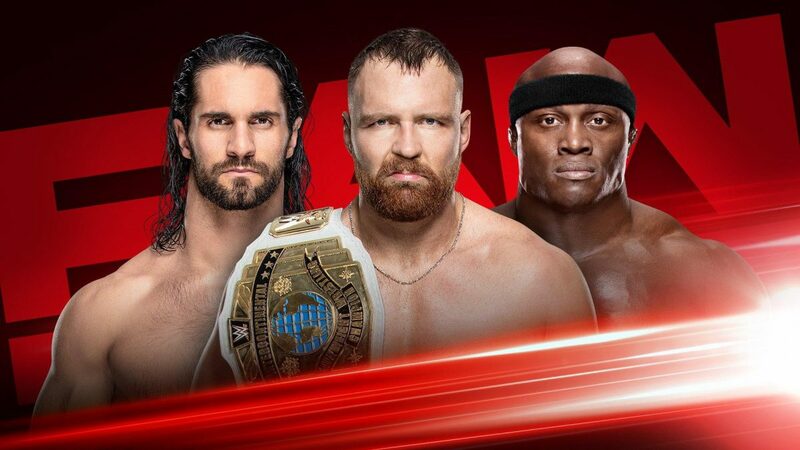 Lashley and Ambrose join forces to attack Rollins. They take turns attacking Rollins. Lashley hits a suplex and covers, but Ambrose breaks it up. Ambrose tells him to relax. Ambrose holds Rollins up for Lashley to punch. Lashley then holds Rollins up, and Ambrose kicks him. Ambrose and Lashley continue to attack the midsection of Rollins. Rollins sidesteps an avalanche from Lashley and fights back. Lashley then KILLS Rollins with a spinebuster. Ambrose then knocks Lashley out of the ring. Rollins catches Ambrose with an inside cradle for a two count. Rollins knocks Ambrose out of the ring. Rollins then hits Ambrose and Lashley with a suicide dive. Lio Rush gets in the ring. Rollins tries to attack, but Rush evades him. Rollins chases him, so Lashley gives Rollins a spinebuster on the floor! Lashley follows up with a belly-to-belly suplex on Ambrose on the floor! We come back from the break to see Lashley applying a chin lock to Rollins. Ambrose runs in and clotheslines Lashley. Rollins and Ambrose team up to take out Lashley. They then turn and face each other before stomping away at Lashley. Rollins and Ambrose then clothesline Lashley out of the ring. They then grab the top half of the steel steps and hit Lashley with them at ringside. Rollins gets in the ring and demands Ambrose get back in the ring. Ambrose gets in the ring, and they get into a hockey fight. They chop each other before Rollins rolls him up. Rollins hits Ambrose with a falcon arrow, but Rush breaks up the pin. Rollins chases Rush around the ring. Rush gets back in and clubs Rollins. Rollins stops him, and Ambrose knocks Rush from the ring. Rollins superkicks Ambrose. Lashley quickly knocks Rollins out of the ring and covers Ambrose, but he kicks out. Lashley is furious. Ambrose quickly kicks Lashley and pokes the eyes. Rollins hits Ambrose with a springboard clothesline before catching Lashley with a step-up enzuigiri. Rollins hits Lashley with a big frog splash. Ambrose throws Rollins out of the ring and covers Lashley, but Lashley kicks out. Ambrose cannot believe it. Ambrose and Lashley go for a Doomsday Device, but Rollins “lands” on his feet. Rollins takes them down, but Rush pulls the rope down to get him out of the ring. Lashley follows up with a Spear on Ambrose to pick up the win! Bobby Lashley celebrates with Lio Rush. This is the first time Lashley has ever held the WWE Intercontinental Championship. We’ll have A Moment of Bliss, next. A stagehand knocks on her dressing room door with her latte. Bliss doesn’t answer, so he comes in. Bliss is disrobed, but covering her chest. She’s upset, so the stagehand runs off. Alexa Bliss makes her entrance. Bliss mentions that Mr. McMahon announced their would be Women’s Tag Team Championships coming. Bliss knows when they’re coming. Bliss announces that three teams from RAW and three teams from Smackdown Live will compete in the Elimination Chamber. The winning team will walk out as the new WWE Women’s Tag Team Champions. Bliss reveals the championships. The winner of this match will receive a WWE Universal Championship match against Brock Lesnar at the Royal Rumble event. The match rings, and McIntyre quickly knocks Cena out of the ring. In the ring, Balor gets on the apron and kicks Corbin down. Balor goes to the top rope, but Corbin pulls him down and hits a chokeslam backbreaker for a two count. We come back from the break to see Corbin go shoulder-first into the ring post. McIntyre knocks Cena out of the ring. Balor kicks McIntyre back and knocks him from the ring. Balor goes for a running kick from the apron, but Corbin knocks him off the apron. Cena gets in the ring and hits Corbin with a tornado DDT. McIntyre breaks up the pin and punches away at Cena. McIntyre talks trash to Cena, but Cena quickly comes back with a pair of shoulder tackles and a back suplex powerbomb. Cena hits McIntyre with the 5 Knuckle Shuffle and goes for the Attitude Adjustment. Cena connects and covers McIntyre, but Corbin breaks up the pin. Corbin clubs Cena in the back. Cena tries for an AA, but Corbin gets out. Corbin goes for a suplex, but Balor runs over. Balor and Cena hit a double-team suplex on Corbin. Cena and Corbin double-team Corbin in the corner and go for a double-team superplex. McIntyre then comes over and powerbombs Cena and Balor. Corbin holds the top rope to avoid the superplex. McIntyre attacks Corbin and tries for a superplex, but he seems to slip. Corbin gets him in the tree of woe, but McIntyre sits up and hits a slam off the top. McIntyre signals for a Claymore Kick, so they go to commercial. We come back from the break to see Corbin hit Balor with the End of Days, but McIntyre breaks it up. Corbin gets to his feet and stares at McIntyre. Corbin and McIntyre begin brawling. Corbin goes for his out and in clothesline, but McIntyre head-butts him. Cena comes off the top rope, but McIntyre counters into a powerbomb for a near fall! Corbin and Balor brawl while McIntyre takes Cena down. McIntyre and Corbin are left standing. Cena and Balor then make stereo comebacks. Cena knocks McIntyre out of the ring while Balor hits Corbin with a Sling Blade. Cena goes for an AA on Balor, but Balor slides off and kicks him. Cena cuts Balor off on the top rope and tries for a Super AA. Balor fights it, but Cena connects with the Super AA. Corbin throws Cena out of the ring and covers Balor, but Balor kicks out. Corbin goes outside and grabs a steel chair. Corbin cracks Cena in the back with the steel chair a few times (there are no disqualifications in a Fatal 4-Way match). Corbin then attacks McIntyre with the chair. Corbin gets in the ring and hits Balor with the chair twice. Corbin covers Balor, but Cena breaks it up. Corbin punches Cena down and goes for a chair shot, but Cena moves. Cena hits Corbin with an AA, but he then turns right into a Claymore Kick! Balor takes McIntyre out with a big DDT. Balor hits Cena with a big Coup de Grace and picks up the win! Cena loudly said something to Balor during the pin. Finn Balor will face Brock Lesnar for the WWE Universal Championship at the Royal Rumble event. 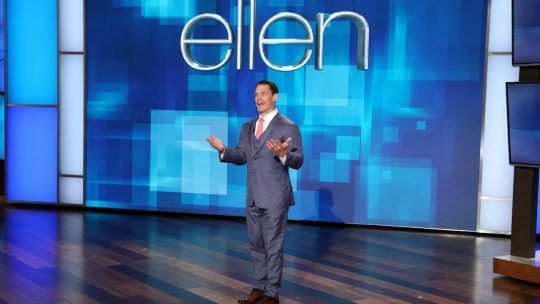 John Cena grabs a microphone and says you have to fight for an opportunity and respect. Earlier tonight, Vince McMahon said he didn’t believe in Balor. Balor told him the people do. Cena says Balor has one more person believes in Balor. Cena tells Balor to give Lesnar hell at the Royal Rumble. Cena then endorses Balor before the crowd.